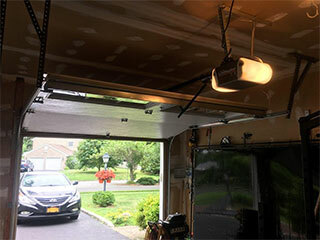 Your garage door opener is responsible for providing the initial jolt of energy required to move your springs into action and begin the heavy work of lifting the door. Like any complicated, sensitive electrical device, specialized knowledge is required to install and maintain this unit properly. Fortunately, Garage Door Repair Santee has your back. There are lots of choices out there when it comes to opener design and brand, meaning the choice isn’t always easy to make. Price and reliability are the most obvious factors, but issues like noise, bulk, and compatibility with modern 'smart' control systems are harder to account for. Our team is familiar with the products of every major manufacturer, and will be happy to suggest and provide the best model for your needs, preferences and price range. We provide comprehensive installation services for new home owners having their garage door systems set up for the first time, as well as opener replacements for pre-existing systems. If your opener has broken down, or just isn’t satisfying you with its performance, our team can help you choose a new one and fit a new one. Just like any other hardworking machine, your opener should receive periodic maintenance to keep it working smoothly. Our technicians can make sure everything from the wiring and circuit boards to the motor and trolley cables are in good condition and properly connected to the rest of your system. If your opener is making strange noises, or is not being as responsive as it used to, you should let us have a look at it before the problem gets worse. Even a perfectly functional garage door system should receive a diagnostic session every six to twelve months, to prevent problems from taking you by surprise. Let us know about your opener needs, and we'll have our professionals at Garage Door Repair Santee on their way to you as soon as possible. Get in touch today!